The West Embankment (Vestvolden) is a military embankment which stretches west around Copenhagen (København) like an enormous green bow. It is one of the few remaining protective embankments remaining in Copenhagen from the old days when it was a fortified town. The other is the Kastellet on the eastern side of town. 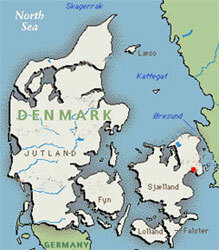 The Kastellet is an old military for on Oresund (Øresund), which is the sound which separates Denmark from Sweden. The embankment also contains a moat. Today West Embankment is essentially a pleasant park where Copenhagener’s flock during nice weather. The park is a nice area to get away from the city and enjoy some peace and quite in the outdoors. The Danish Nature Protection Association (Danmarks Naturfredningsforening og Foreningen Vestvoldens Venner) made the West Embankment a preserved area in 1994. The trees along Voldgaden (the street which runs along side the West Embankment) make it probably the longest avenue in Denmark. Vestvolden was built from 1888-1892. In more than one way this project was quite groundbreaking. Concrete was used in the construction of the many canon bunkers. These bunkers look surprisingly similar to World War II bunkers, and some of these bunkers remain. These bunkers called kaponierer were constructed in a staggered formation in relation to one and other. This meant that you could shoot along the embankments and prevent enemies from crossing without shooting your own soldiers in the next bunker. The bunkers were built approximately 600 meters apart. This facility was never used in combat, and it was shut down in 1920.